£10 ($15/€14) direct from our shop. Postage and packaging not included. Worldwide postage available. 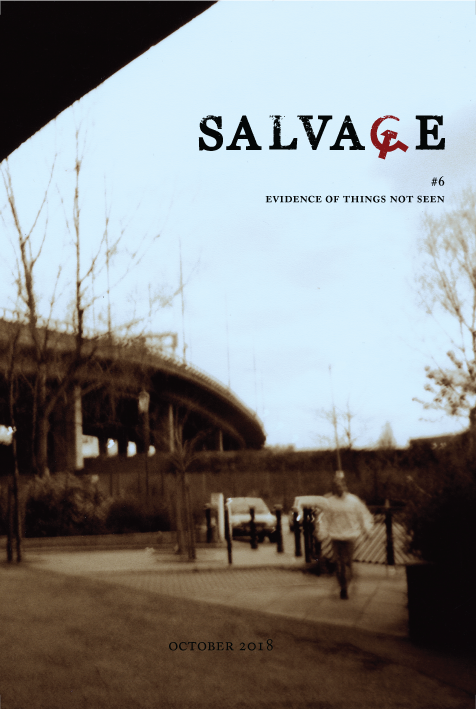 The forthcoming sixth issue of Salvage. Politics and the English language – among others – redux. Bromides, ornamentaphobia and the elitism of ‘clarity’. Beyond economics and ideology to a jurisprudential horizon. The law of austerity and the austere grounds of law. Fragments, scraps, posters and poems, certainty and its discontents, ethics and hunger and a neglected angel. Navigating sound, fury and fear, the bad faith and even good, in an unstable debate, striving for a theory worthy of the name. Put your finger to your lips. Epistemology, yearning and liberation beyond the limits of words. The universal, the particular, the reactionary and emancipatory in a category overused and under strain. On the eloquence of an enemy, the politics of publishing, and radical reading beyond moralism and special pleading. Towards a chronology of toxicity, of bad answers to good questions and the seduction of exclusion amid political decline. History and histories, universality and particularities in the overdetermined person, subaltern and/or otherwise, itself. Strike-making, strike-breaking, the rise of race and racism in the Republic and the perfidy of the so-called Left. Space, minority-management and maple-syrup racism. ‘Not outside, but against’. Testimony from and of the vilified and unvanquished.